The Phalanx continues their attempts to assimilate and scan Monet to no avail while she uses this time to learn all she can about them. The team track down Everett a new mutant about to be arrested by the police. 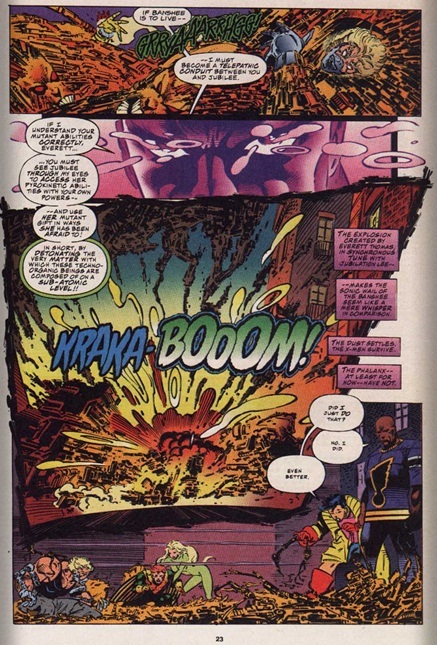 The Phalanx attack and quick thinking from Emma Frost allows Everett using Jubilee’s powers to decimate their foes. Elsewhere Paige Guthrie is captured by the phalanx and the team learns mutant hater Scott Lang is involved and has captured a few other new mutants. In the chaos Sabretooth manages to escape his shackles which were keeping him restrained. Art- Andy Kubert provides the artwork in this one and everything looks good even by today’s standards. I particularly like Kuberts rendering of the Phalanx, Banshee and Synch, they each have a distinctive style lost when Maduiera draws them. 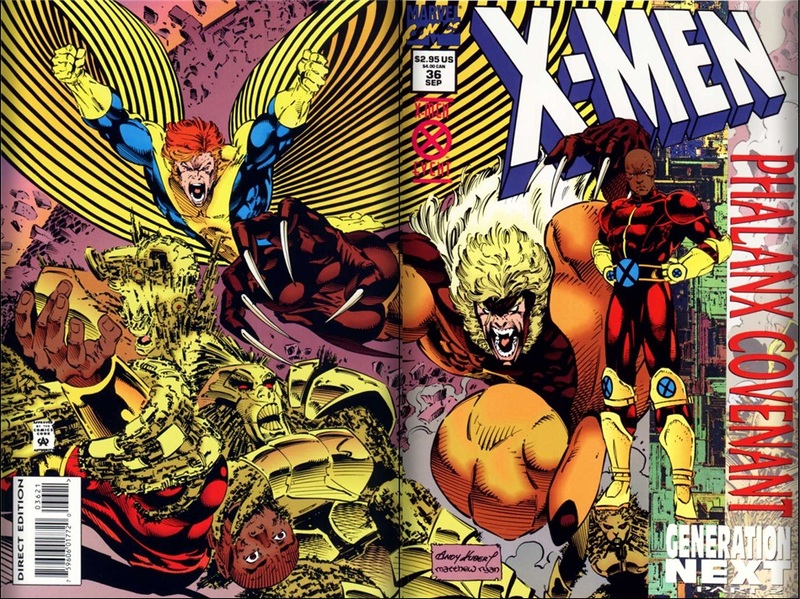 Cover- This one features Everett Thomas/Synch as the spotlight character in his Generation-X costume. Unlike nowadays he has this rich dark skin tone that seems natural. The rest of the cover shows Sabertooth, Emma and Banshee cleaning house with the alien Phalanx. Unleashed- Many modern readers won’t get the context or the terror of having Sabertooth off his leash at a time like this since he loves to kill anything that moves particularly the friends of Wolverine. So the X-men are missing, they are facing an unknown foe who’s abducting the next generation of mutants and now the most notorious mutant killer alive is on the loose? Color this a really bad day! Black Hero- Synch my now long dead full of potential black natural leader with an awesome power set in his debut. To this day I’ve not gotten over his death and writers lack of imagination with resurrecting him. He’s not mentioned even in peter David’s X-factor which stars Monet St. Croix with whom he shared a romance before his death. Monet (or the m-twins posing as her) also gets a cameo in the beginning and we learn that the Phalanx are having a hard time scanning and/or assimilating her while she also appears to be scanning and learning about them in the process. After this storyline Monet has never displayed this skill again. I’m realizing a trend with this girl and powers she no longer displays. The colors have not aged as well as the art work. Small Nitpick Emma claims this issue that Ev was using Jubilee’s powers in a way she had never done before but this is wrong. She did in fact use her powers in this way when herself Psylocke and wolverine were in Japan after Psylocke and the X-men had passed through the Seige Perilus.